For 2008, the Mercedes-Benz E-Class continues without major changes, but a new AMG Sport Package brings many of the appearance cues from the E63 AMG-including the flashy wheels, AMG steering wheel, and manual shift paddles-to the V6 E350 or V8 E550. Also, the PRE-SAFE system is now standard across the entire E-Class line. 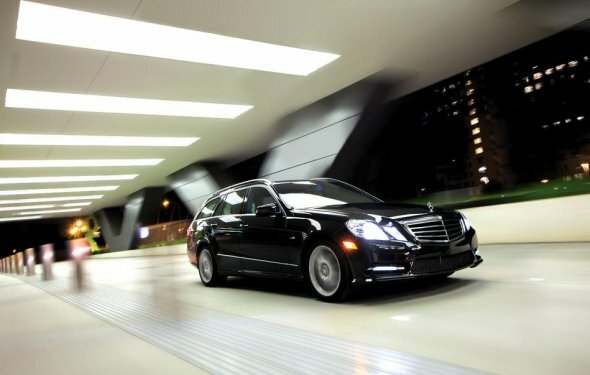 Performance (E550 and E63); fuel efficiency (E320 Bluetec); spacious interior; ride comfort. The E-Class range of luxury sedans and wagons can fit a wide range of needs, from the fast, showy, and exclusive E63 AMG to the more practical E350 and the economical, green-friendly E320 Bluetec diesel. Across the line, the E-Class has a very roomy interior and nice ride, both which make it well-suited for long trips. With 4MATIC all-wheel drive available on E350 and E550 models, the E-Class also makes a good all-weather bet for those who live in the Snow Belt, too.